ABOARD THE PAPAL FLIGHT FROM CUBA (CNS) — Pope Francis defended his position on the economy, the environment and other social issues as faithful repetitions of the basic Catholic social doctrine. “‘Well, because he renounced the red shoes, which are so historic,'” the pope said the woman responded. People have all sorts of reasons to think, “he’s communist or he’s not communist,” the pope said. “The problem of the embargo is part of the negotiations. This is public. Both presidents have said this. It is part of the journey toward good relations that is underway,” he said. “My desire is that they end up with a good result, with an accord that satisfies both sides,” he said. The Sept. 19-22 visit to Cuba was “a bit of a coincidence,” the pope said. He had hoped to enter the United States through Ciudad Juarez, Mexico, like so many people do. But the idea changed when Cuban President Raul Castro and U.S. President Barack Obama announced they had an agreement to begin normalizing their relations. “It was very clear I was not holding private audiences in the nunciature — not even with other heads of state,” the pope said, apparently referring to Argentine President Cristina Fernandez de Kirchner, who had traveled to Havana for the papal visit. Officials at the Vatican Embassy in Havana did, however, make a telephone call to a representative of a dissident group and invited several members of the group to be among those greeted by the pope at Havana’s cathedral, he said. “I greeted many people there, but no one identified himself as a dissident,” Pope Francis said. Pope Francis was also asked about his private meeting with former Cuban President Fidel Castro and specifically if he thought Castro had “repented” of having treated the Catholic Church so harshly. “‘Repentance’ is something intimate, having to do with the conscience,” he said. “In my meeting with Fidel we spoke about the Jesuits he had known” as a student of a Jesuit school, the pope said, and about how hard Jesuits used to make their students work. 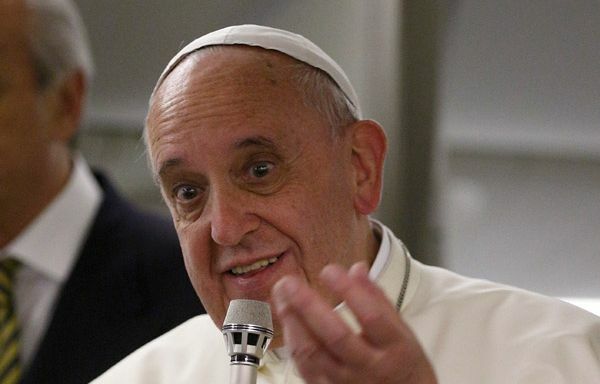 “And we spoke a lot about the encyclical, ‘Laudato Si’,’ because he is very interested in the theme of ecology. It was not a very formal meeting, but spontaneous, with his family there,” the pope said.